Katie Fetch has had a strong passion for math and science since she was young, but after taking her first class in Mechanical Engineering, she decided it was the field for her. At Kennametal, Katie is working as a co-op on the Global Machining Technology (GMT) team. As a co-op, she is altering between working at Kennametal and taking classes at the University of Pittsburgh until she completes a full year of work. 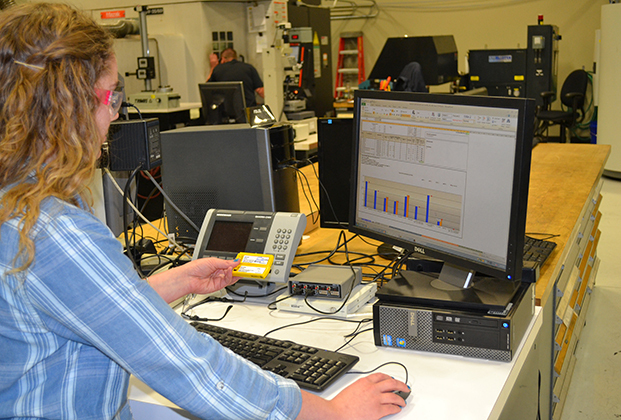 At Kennametal, the GMT team is involved in nearly all phases of new product development. 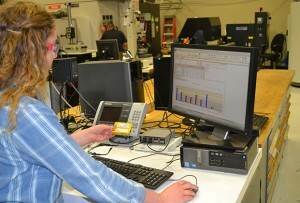 This process includes focuses on the testing of the tools and providing high-level technical support to the customers. Additionally, GMT is responsible for providing technical reviews of product publications and support testing for developing the manufacturing process. After Katie fills out the paperwork, testing is ready to be performed in the lab. Katie and her team supervise testing and analyze the results. Katie is looking forward to start learning how to implement statistics when analyzing test results by using a program called Minitab. Katie noted that the Technician Team recently taught her an interesting skill: CNC programming. This type of programming is a code used to program metal cutting machines. Each individual movement (speed, direction, size and depth of cut) of the machine has to be programmed before any cutting begins. Field trips are always a great experience to gain insight into the variety of Kennametal plants. “As part of the GMT team, I went on a field trip to a customer location.” At the plant, they use Kennametal tools to machine molds. Those molds are later used by their customers to make glass objects. Katie stated that it was interesting to learn how products related to other industries are made. Also, she says it gave her more insight into differences between various types of manufacturing processes. “This was my first customer-visit trip and I am looking forward to other trips,” she says. 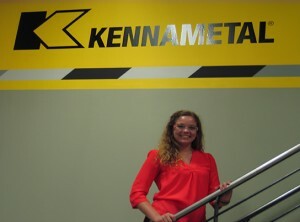 After her co-op is over Katie hopes to work here at Kennametal.